Self-Guided Visits: Self-guided groups of 10 or more students are asked to book their visits in advance. Our education staff can make recommendations of approaches you can take with your class while visiting the museum. We recommend a maximum of 90 minutes for a self-guided visit. 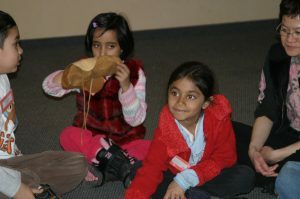 To book a self guided visit please contact our Education Department at education@batashoemuseum.ca or 416-979-7799 x 242. Guided programs are one hour and cost $6 per student. We suggest allowing 30 minutes after your guided tour for supervised discovery of the rest of the museum. School groups may also reserve use of the lunchroom. The lunchroom allows seating for up to 48 people. 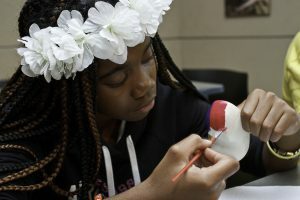 Grad Jk-8: The program includes a gallery visit, plus a “Hands-on Artefact” session where students get to handle and examine museum objects up close. Kindergarten programs also include a try-on shoe session. Grade 9-12: The program includes a one hour guided tour of two exhibitions of your choice. Alternatively, teachers may request a 30 minute guided tour combined with a 30 minute “Hands-on Artefact” session or a “How to Read a Shoe” session. Grade 9-12 ESL: These highly participatory tours engage students in conversation, encourage questions, and give learners an opportunity to practice their language skills. This one hour guided program includes a gallery visit and a “Hands-on Artefact” session. 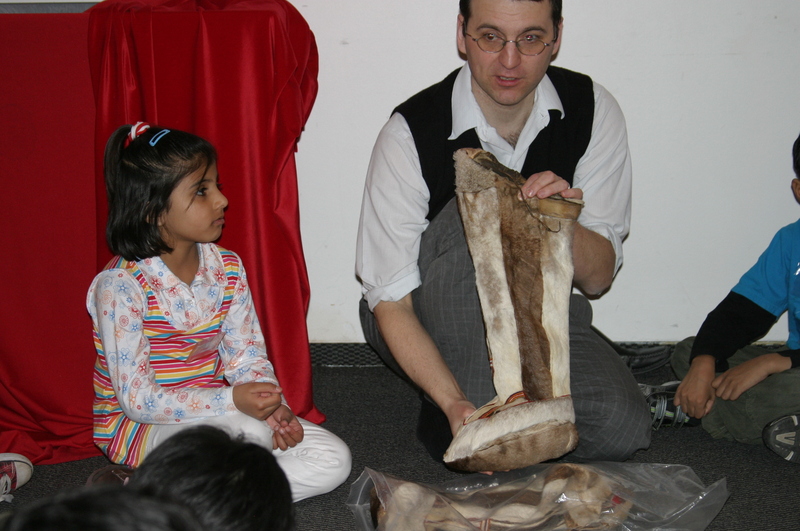 To book at docent guided program please contact our Education Department at education@batashoemuseum.ca or 416-979-7799 x 242.
Who says you can’t touch at a museum! Enhance your visit with multi-sensory and tactile experiences through our ‘Hands-on’ program. Your students will get to examine objects up close while experienced guides explain the fascinating stories behind the shoes. Tactile experiences benefit kinaesthetic learners, and help communicate key information to English Language Learners and those with low vision. Hands-on Artefact Sessions are available for all grades upon request. In this 30 minute session, students are introduced to the concept of reading artefacts. While working in small groups, students learn to ask important questions and search for clues that reveal information about many aspects of the object. This session is ideal for grades 7-12. Extend your visit to 90 minutes with our popular Paint-a-Clog workshop. Each child receives a miniature clog imported from the Netherlands to decorate and take home. There is an additional charge of $7 per student for this option.